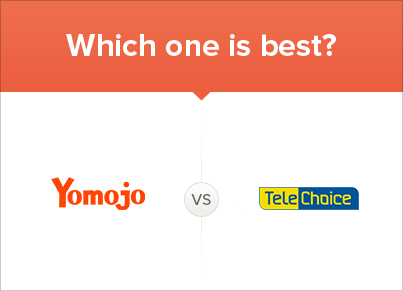 Comparing Yomojo VS TeleChoice – Which Is Best For You ? Here are the key findings for both Yomojo and TeleChoice, including their services & coverage. There are more details in the review which follows below. Yomojo offer customisable mobile data prepaid and postpaid plans, operating on the Optus 4G Plus network. TeleChoice with a strong retail store presence, offer subscribers access to part of the Telstra 3G network. Yomojo and TeleChoice are two competitive MVNOs operating on the Optus 4G Plus and Telstra 3G networks. Both of these two companies offer great value plans with all the usual calling and SMS features. With prepaid and postpaid on offer, there is a lot of choice to look at before picking your next plan. For users with an older mobile phone or those which live in a rural area, TeleChoice is an option. But for Aussies which live in the city, Yomojo offers much better plan options and network than TeleChoice does. Yomojo also provides great deals on large mobile data plans, all on the much faster Optus 4G Plus network. Yomojo is the clear winner. Yomojo is the clear winner when it comes to comparing which of the two is best, between Yomojo and TeleChoice. TeleChoice while only operating as an MVNO since early 2013 does have a large store front presence. Now, if you have an older mobile phone, that’s not 4G enabled, TeleChoice can be an option for you to choose. But you do need to keep in mind that they only provide access to part of the Telstra 3G network, not the full Telstra network. For Aussies which live in rural or remote areas, or using an older smartphone, Boost Mobile is a better alternative. Yomojo on the other hand offer plans with more choice and customisation, all on the superior Optus 4G Plus network. Yomojo lets subscribers access the full Optus 4G Plus network, while users with TeleChoice can only access part of the Telstra 3G network. For subscribers that have an older mobile phone TeleChoice is the best bet, or for people who are happy using the slower 3G network. As always, when looking at which of the two companies is best, you need to look at your personal habits. The Optus 4G Plus network covers 98.5 percent of the Australian population, giving users faster data speeds in even more places. The Telstra 3G network (which TeleChoice only uses part of), has been upgraded to the more recent Telstra 4GX network. For users which need to be on the Telstra network, Boost Mobile is a much better choice of MVNO. Yomojo and TeleChoice provide subscribers with a broad range of affordable plans, at competitive pricing points. TeleChoice provide SIM only no lock-in plans, as well as 12 and 24 months postpaid plans. It’s interesting that Telechoice have chosen to offer less mobile data on each of their no lock-in plans, when Yomojo is doing the opposite. If you want lots of data on the TeleChoice plans, you have to choose either the 12 or 24 months ones on offer. Yomojo on the other hand has increased the amounts of data on all of their plans, which operate on the usual 30 days recharge basis. For users that like to pick and choose what features their plans include, Yomojo offer a great deal more customisation than TeleChoice. Yomojo operates on the Optus 4G Plus network and TeleChoice is on part of the Telstra 3G network. For city and major urban users, Yomojo is the best MVNO for you. If you are an Aussie living in regional Australia, than TeleChoice is a good option. But if you need to be on the Telstra network, the third option of Boost Mobile actually offers you a better deal. For more information on coverage of the Optus 4G network, take a look at the Whatphone coverage page. The Optus 4G Plus network provides coverage to 98.5 percent of Australia. For people which live in rural Australia, at Whatphone we recommend that you review Boost Mobile, a Telstra 4G network MVNO. Yomojo’s plans can be bought either prepaid or postpaid giving users a choice based on their personal needs. TeleChoice offer their subscribers the options of no lock-in (month to month), 12 months and 24 months. On the TeleChoice 12 and 24 months contracts, they do offer larger amounts of mobile data, then if you were to select the no lock-in ones. Not sure of the difference between prepaid and postpaid? Read our article about it. In general though when it comes to prepaid or postpaid, at Whatphone we believe prepaid plans are be more predictable. Yomojo and TeleChoice plans come with both small and big amounts of mobile data. This is perfect for subscribers as it allows you to make a choice based on your personal monthly usage habits. Yomojo in this regard offers much more flexibility of self choice, than TeleChoice does. This is thanks to the customisation tool on the Yomojo website, allowing subscribers to choose exactly how much to pay for each month. Yomojo has also recently increased the amount of mobile data included in each of their plans which is fantastic. The industry is highly competitive and a lot of different MVNOs are currently doing this. TeleChoice on the other hand offer similar inclusive mobile data amounts. But, to take advantage of the big data allowances at TeleChoice, you need to be on either their 12 or 24 month plans. Telechoice is rewarding users with extra data, for choosing to be signed up for the minimum 12 or 24 months. At Yomojo though, you don’t need to agree to a long term plan to receive a large mobile data allowance. For people which prefer lots of data on prepaid plans, with TeleChoice this could be a deal breaker. When it comes to which provider offers the best customer service TeleChoice is the leader of the two. Yomojo is a new company and doesn’t have the customer service experience or store fronts which TeleChoice has. That’s not to say Yomojo is provides poor customer service, far from it, it’s just they are new to the Telco industry. TeleChoice is one of the rare MVNOs which has a large network of retail store fronts, which subscribers can use for support. TeleChoice as an established company also has a very popular Facebook page and overall social media presence. Both Yomojo and TeleChoice offer phone support and live chat on their respective websites. Yomojo offer full plan customisation thanks to their easy to use plan selector tool on their website. Subscribers to Yomojo can pick and choose their inclusions up front before subscribing to their preferred plan. While TeleChoice is a good option for users which live in rural or remote areas of Australia, it’s not on the full Telstra 3G network. If you do have an older smartphone that is not 4G ready, TeleChoice could be a good option. But, Android 4G enabled smartphones are extremely cheap to buy these days, especially when shopping online from Kogan. And there other MVNOs such as Boost Mobile, who operate on the full Telstra 3G and 4G networks.